I have outlined a selection of my most popular cakes but if you have a favourite which is not listed I would be pleased to make this for you. A light sponge baked with pure vanilla extract brushed with vanilla syrup and layered with raspberry jam and vanilla frosting. Lemon sponge drizzled with lemon syrup and Lemoncello while still warm. 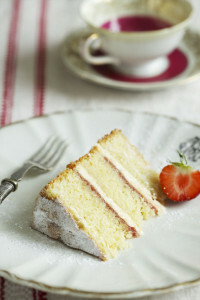 Layered with lemon buttercream and lemon curd. Orange sponge cake drizzled with orange syrup and Cointreau while still warm and layered with orange buttercream and chocolate ganache. Very light and moist this cake is fat free (made with oil) and will keep for up to two weeks. Delicious with a cream cheese frosting. Chocolate sponge made with pure chocolate extract. Drizzled while still warm with chocolate syrup and layered with chocolate buttercream. Made with pure coffee extract and drizzled with coffee syrup while still warm. Layered together coffee buttercream.